Born in Shinshu, central part of Japan. Starts playing arpa at the age of 13 under instruction of her mother, who is also a professional arpa player. Later years she makes trips several times to Paraguay and receives education from famous arpa professionals, and makes a notable growth. In 1998, performs at the biggest music festival in Paraguay “Festival De Tacuare” as the first Japanese who ever participated and receives “Special Award”. In 1999, wins the 1st prize at the 2nd Japan All National Arpa Competition. In the same year, receives a title of “Maestro of Arpa” at the 5th Funjo Musical from Veracruz Art University in Mexico. Then Agematsu makes a major debut by releasing the 1st solo album “INOCENSIA” from King Records. After that, she increases appearance in various media (TV, radio, magazines, and newspapers), mainly in Japan. She also performs at concerts in Paraguay and Mexico, and at times makes appearance in local TV and radio programs in those countries. As she becomes well-known, the number of concert increase and it counted more than 200 in one year in the year 2002. From 1999 till 2002, released 6 albums and 1 Live DVD. In 2003, takes a recess in entertainment activity. During the recess, travels abroad and gets broader view of arpa and music, and engages in composition. Also during this period, continues activity as an instructor. Resumes entertainment activity in July, 2004. At the close timing, sets up her own management office and concluded a contract with Universal Music Japan. Released a full original album titled “mika AGEMATSU” in February 2005 from Universal Music Japan. Received the honor of “Awards To Women” in the “Art Category” from Avon Products Co. Ltd. in 2005. Her music expression by arpa is not limited to traditional South American music, and makes a challenge to other field such as cinema music, etc. She continues to seek her own originality and sound. Her brilliant technique and sound quality attract many. Introduced as “Face of the year” in “Woman of the Year 2006” of Nikkei Woman. Japan Record Awards” on year end eve as a guest and performed. Roppongi, Tokyo in May of the same year. new album “Cruz del Sur” performed by that group. Foundation to those who achieved an excellent work in culture and sports related activity. Kiko (Japan Travel by Photographers)”. 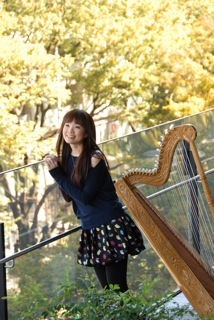 While her work is based on performing at concerts and producing CDs, she has been making outstanding progress by expanding her activities in composing music and playing with various styles and in circumstances as one of the best Japanese Paraguayan harp players.